Summer tomatoes, fresh basil, and milky mozzarella are all you need. Some years ago, Charles and I spent a month in Rome. Every day, we would explore a different section of the city, but our favorite neighborhood was between the Piazza Navona and the Tiber. Most days we would head there for lunch at a favorite trattoria, and most days we would order Pasta alla Checca. It is the perfect pasta for a summer day, light and fresh, and the ideal way to celebrate the great flavors of juicy summer tomatoes, fresh basil, and milky mozzarella. The sauce is not cooked, just marinated for a short time and warmed by the hot cooked pasta. At the restaurant, the chef used tubetti or ditalini pasta, the ideal choice because the tomatoes and cheese were cut into the same size pieces. 1. Cut the tomatoes in half and remove the cores, Squeeze out the tomato seeds. 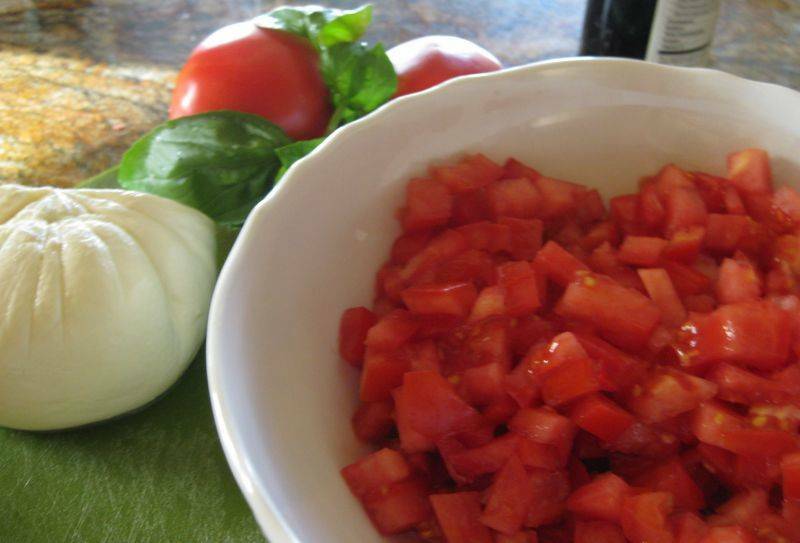 Chop the tomatoes and place them in a bowl large enough to hold all of the ingredients. 2. Stir in the oil, garlic, and salt and pepper to taste. Stack the basil leaves and cut them crosswise into thin ribbons. Stir the basil into the tomatoes. Cover and leave at room temperature up to 1 hour. 3. Bring at least 4 quarts of salted water to a boil in a large pot. Stir well. Cook over high heat, stirring frequently, until the pasta is al dente, tender yet still firm to the bite. Drain the pasta and add it to the bowl with the pasta. Add the mozzarella and toss again. Serve immediately. This is not a pasta salad. It should not be served chilled. In Rome we often ordered grilled anchovies to follow it. Sardines, or another grilled fish, would be just as good. What's the ideal wine? Charles recommends chilled Frascati.